The map above reveals the physical landscape of Australia. In the center of the continent are the Macdonnell Ranges and the Musgrave Ranges along with the Lake Eyre Basin and the Lake Torrens Basin. Mountains on the northwestern coast are the Capricorn Range, the Hamersley Range and the King Leopold Ranges. The Australian Alps and Great Dividing Range are on the southeast coast. The Clarke Range and Calliope Range are on the northeast coast. The island of Tasmania has the Great Western Tiers. Major rivers include the Asburton, Darling and Murray Rivers. 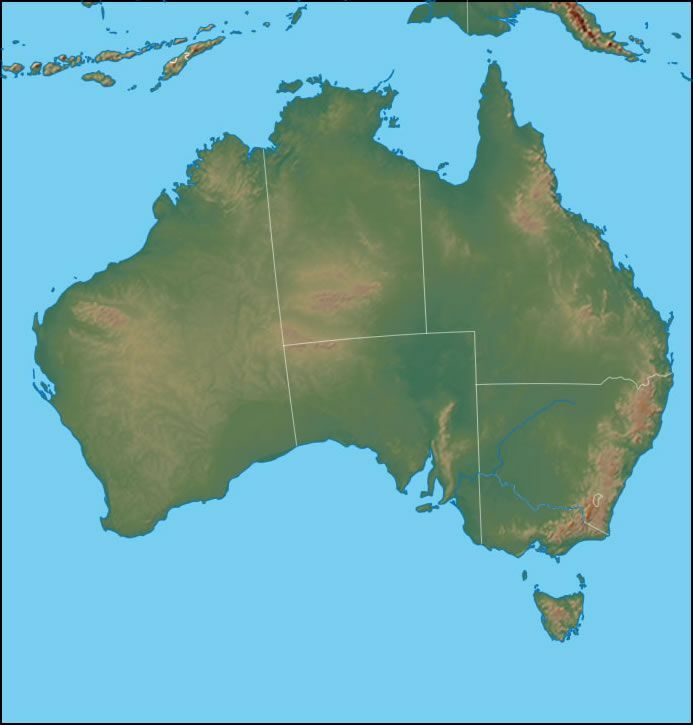 Bodies of water that surround Australia are the Indian Ocean, Timor Sea, Arafura Sea, Gulf of Carpentaria, the Coral Sea, the Tasman Sea and the Great Australian Bight.